Toronto, Canada. I was visiting Toronto which is clean, welcoming and beautiful. Along with my wide angle lens, I often bring along my Macro- lens on trips which include photography. I try to keep my Canon camera as busy as possible, and I ask around if there are any nearby parks in the city, parks that might host a population of butterflies. Yes, I was told, why don’t you drive to West Don Park? It is an easy 10 minute drive from my hosts. I was blessed with light traffic and courteous drivers. My Pennsylvania license plates provided me with quite a bit of latitude once it was noted that I was a visitor. West Don Park? Bingo! A gold mine of butterflies that particular week in mid-July. In Western Pennsylvania I encounter Nymphalis Antiopa infrequently in the spring and even less often in the fall months. Often, the individual butterflies I see are worn and show evidence of failed attacks from predators. This morning in West Don was sunny, no wind and milkweed (Asclepias Syriaca) was in bloom. Three Mourning Cloak butterflies were eating nectar on a single milkweed plant. OMG! Back home I rarely see them nectaring, and those that I do approach, flee once I am within ten feet. Nymphalis Antiopa in Toronto allowed me to approach and photograph from just 18 inches away, and they were sizable butterflies. My heart must have been pounding! I was in a heaven of Mourning Cloak butterflies. These butterflies had fresh colors and an absence of significant wing damage. Their colors were a rich, rich maroon; carribean islands blue, and sunflower yellow. This image captures many of those striking hues. Is this a candidate for being my favorite butterfly? I answer with a sheepish y-e-s. Our two earlier Mourning cloak posts do hint at my little secret. Canada is the wildlife wonder that I long understood you to be. Mourning Cloaks photographed while eating nectar. Can you imagine? August will soon be upon us. Can our Canadian followers suggest a suitable park, with a rich butterfly population, that is within driving distance of Pittsburgh, Pa? Toronto was a 6.5 hours drive. 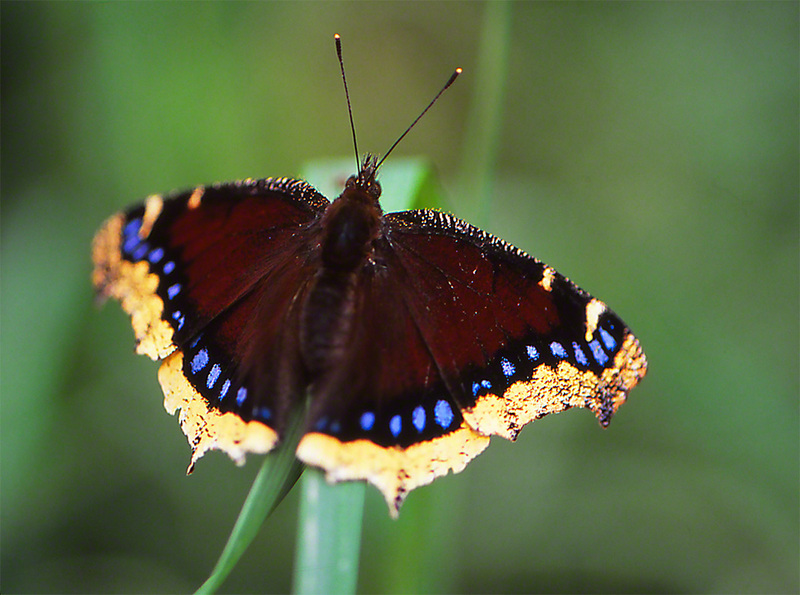 Wow, that is one beautiful photo of a Mourning Cloak. I’m amazed that it let you photograph it from a mere 18 inches. Thank you for visiting my site. Your pictures are beautiful and you are so knowledgeable. I’d love to pick your brains1 I have always loved butterfly’s and photographing them and also for what they symbolize-as you could tell by my poem. I look forward to many visits to your page.